Unfortunately a (private) swimming pool does not only provide holiday feeling but also a lot of work to do. 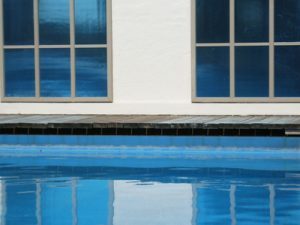 How big the effort is to keep the pool clean depends on the water quality. Often problems with limescale, algae and bacteria are mutually dependent. If the feeding water is very hard, huge amounts of limescale will settle at the walls of the pool. Even if there is only few solved calcium carbonate in the water crusts will form where the water evaporates. These are often difficult to remove. One Merus Ring at the inlet of the pump will change the water so no limescale will form a crust in the pool. The limescale will stay solved in the water or have a soft texture which is easy to remove. We also offer our special Merus Ring Bio, which is also able to prevent algea from growing in the pool. In the best case no new algea settles and existing organisms die and get brown. Thus no chemicals are needed in the water to get rid of the unwanted impurities. The last picture shows one pool before and after the installation of a Merus Ring. On the right picture the limescale at the wall was so soft, it could be removed with a finger swipe.